Jordan Brand has revealed their upcoming Air Jordan Summer 2019 Collection that will begin to release early April and into late June. 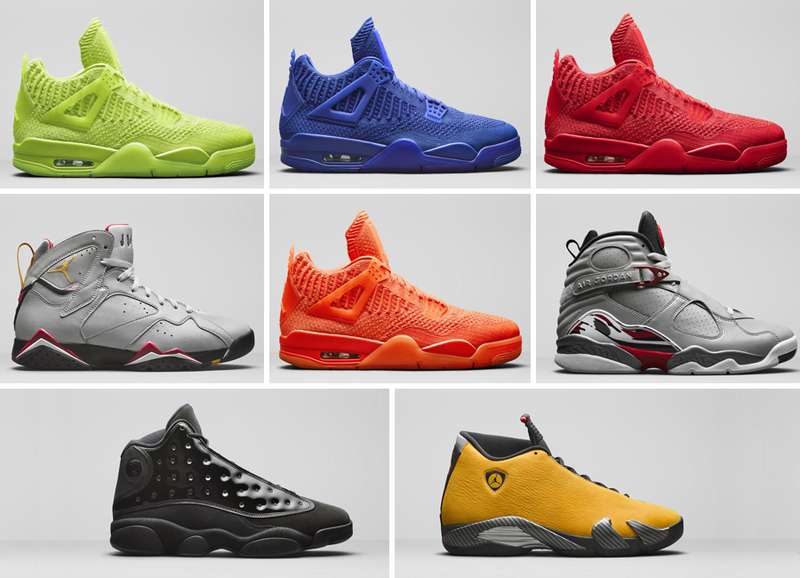 The lineup includes the brand new Air Jordan 4 Flyknit silhouette in four color options, a “Reflective Champion” Collection, an Air Jordan 7 paying homage to Ray Allen, the return of the “Candy Cane” Air Jordan 14 as well as a “Yellow Ferrari” Air Jordan 14. Check out each model as well as their release dates below, and let us know which pair you plan on picking up in the comments section. Celebrating the 20-year anniversary of the Air Jordan 14, a classic colorway returns in true OG form. The silhouette, inspired by luxury sports car styling, has been produced as a stitch-for-stitch replica. The release also comes with original packaging and signature hangtags. For years, the Jumpman community has celebrated milestones in their favorite Air Jordans. Following last year’s Cap and Gown AJ11, the AJ13 is dressed in a patent leather upper and dark translucent outsole with metal emblem and tassel-inspired laces. Hall of Famer Ray Allen has one of the most storied Jordan PE collections in history. To celebrate the 23rd anniversary of his draft, a special colorway of the Air Jordan 7 that brings together two of Allen’s PEs from his time in Milwaukee. MJ’s love for Italian sports cars has served as inspiration for many of his sneaker designs and this colorway matches one of the most famous of these, the AJ14, with a flashy new finish.